Welcome to the Playground Anniversary Series! The Playground Anniversary Series gets underway on Thursday December 17th with a $60 + $10 Win the Button event and then continues that night with a $200 + $20 Deepstack, and on Friday the 18th with a $500 + $50 Deepstack at 11am. Saturday and Sunday will bring a never-before-seen event to the Tournament Hall: the $70 + $10 NL Hold’em 5-Year Extravaganza, featuring 10 Day 1 starting flights! As usual, players who qualify for Day 2 more than once will resume play with only their biggest stack… BUT, for the first time ever at Playground Poker Club, every qualifying stack will get a minimum cash payout as well. 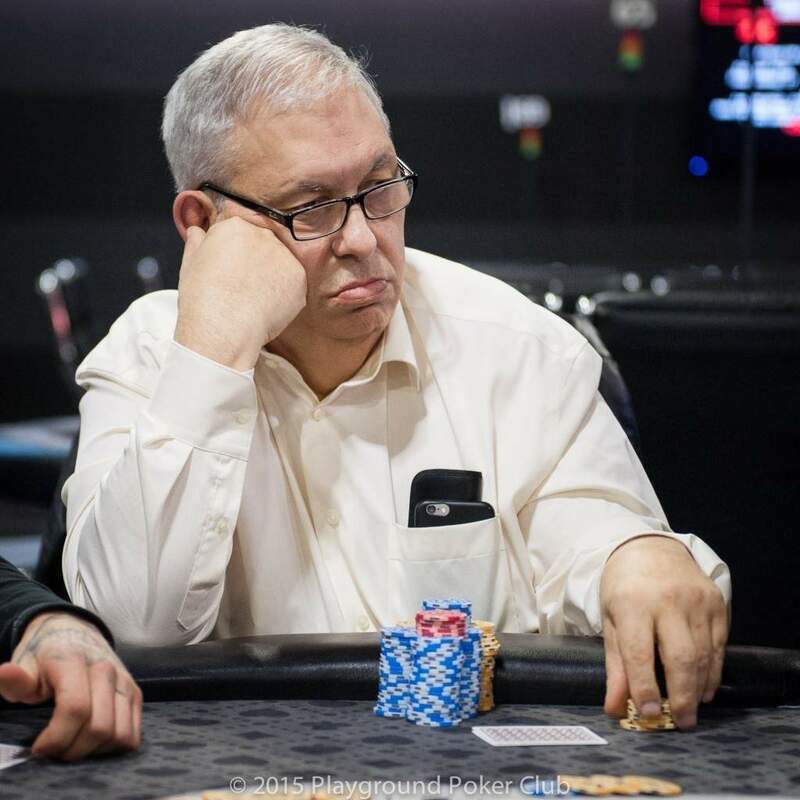 Join Larry Robinson in this amazing event that gives players more chances than ever to qualify for Day 2 and to accumulate some cash on the way! Plus, as the Extravaganza continues with Days 2 and 3 on Monday and Tuesday, you can also play other events - there’s a $60 + $10 Big Ante tourney, and an amazing $135 + $15 + $25 6-Max Bounty to round out the Anniversary Series. After Samuel Pouliot was eliminated, the players declined to re-run numbers for a deal, even though he had been the only one to say no during the previous negotiation, and play continued for about half a level. After a while, though, the players mutually agreed to re-count the stacks and consider another deal based on current stack sizes. 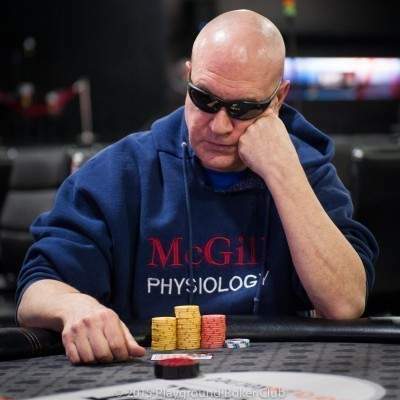 On request, tournament staff brought back proposed payouts for each player, but two players had issues with these – including one of the most (if not THE most) experienced player in the field, Patrick St-Onge. There was some discussion from all sides – all of it very civil, of course – and while this was going on, Cynthia Paquette was furiously writing down a different proposal on a tattered printout of the prize pool. …and they had a deal that everyone was happy with. The 5-Year Extravaganza Champions are: Patrick St-Onge ($7,000), Kathy Sawers ($7,000), Jeremy Chandler ($12,000), Steve Winters ($9,600), Richard Lord ($12,013), and Cynthia Paquette ($7,000). 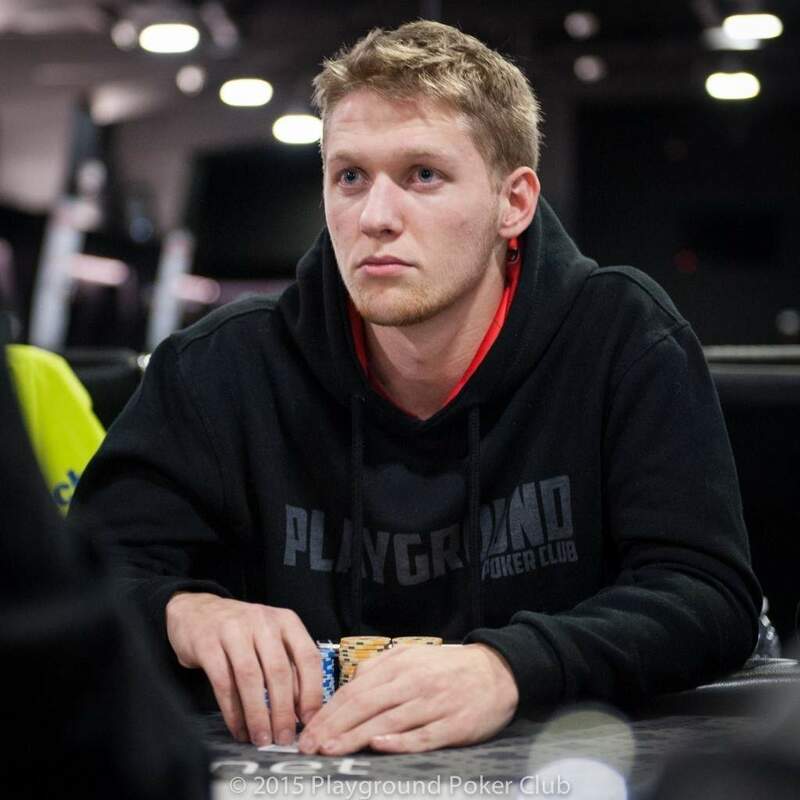 In the first hand following his refusal of the chip-chop deal proposed by the players, short-stacked Samuel Pouliot open-shoved from the cutoff for just over 1,300,000, and found a quick call from Jeremy Chandler in the small blind. 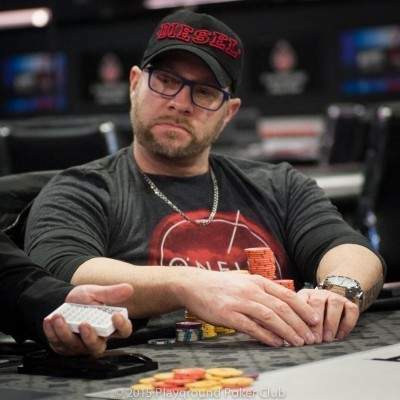 Jeremy’s pair of tens held on for the win, and with that pot he took over the chip lead of this final table, increasing his stack to around 6,500,000. The 7 remaining players have asked to pause the clock to see the numbers of a chip-chop, and the floor is currently making the calculations. Player’s have decided to continue play. 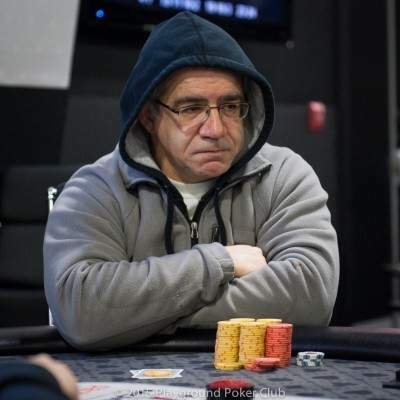 Although heads-up play started quite even in stacks, with both players holding over 50 big blinds to start, it didn’t take long for Pierre Andre Prevost to start chipping away at Alexandre Lavigne’s stack. After a few orbits, Pierre had a healthy 6-to-1 chip lead on his opponent, leading up to the final hand of play. 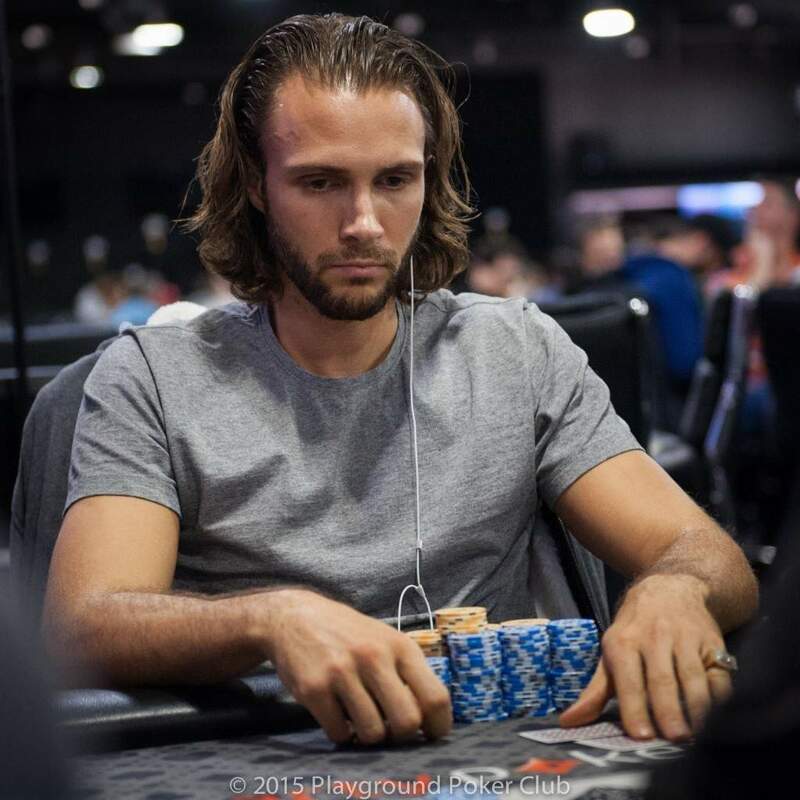 Pierre opened to 60,000 from the button, and was faced with an all-in worth around 350,000 by Alexandre. He thought about his options for a moment before committing the chips, and found himself way ahead, as he tabled versus the of Alexandre. The flop changed everything though, as Alexandre paired his kicker, however the river gave Pierre the better hand, as the final board showed . 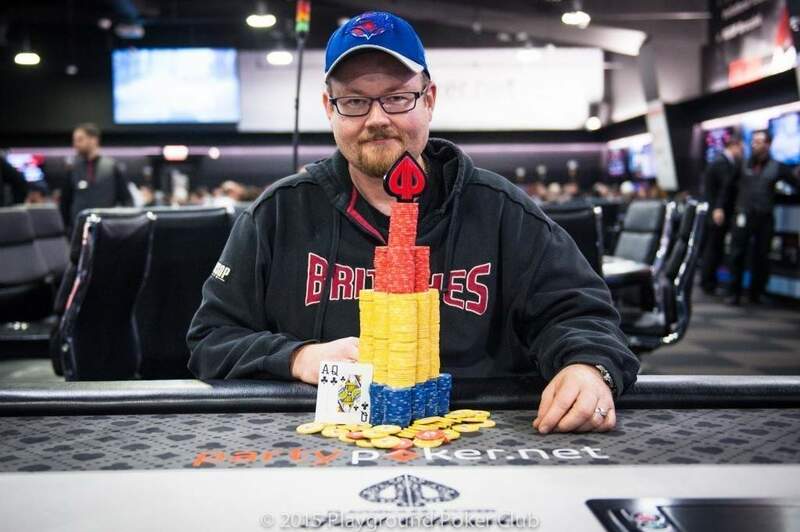 With that win, Pierre collected a cash prize worth $12,495, as well as bragging rights, while Alexandre pocketed $9,45 for his second place finish. We have now reached heads-up play in this $500 + $50 Deepstack tournament, part of the Playground Anniversary Series. The two remaining players are Alexandre Lavigne (~1,150,000) and Pierre Andre Prevost (~1,450,000), who are battling it out for the top prize of $12,495! The runner-up will take home a compensation prize worth $9,450. Simon Huard-Dufresne opened to 40,000 from the small blind, and found a call from Alexandre Lavigne in the big blind. On a flop of , Simon fired 55,000, and then pushed all-in following a raise by Alexandre to 120,000. Alexandre made the quick call, and the two players tabled their hands. Simon needed to spike a straight card to survive, but was drawing dead once the turn brought the . The river was a meaningless , and Alexandre scored the double up. 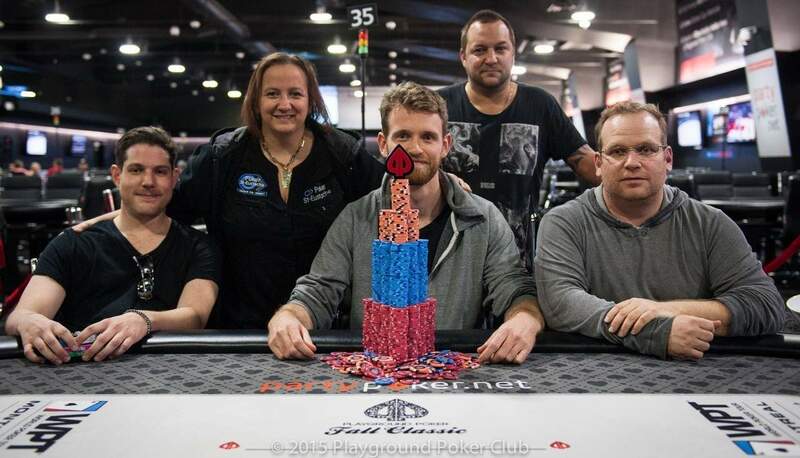 He slid forward 459,000 chips, and once all was paid out, Simon was left with only 6,000 to his name. He chopped the very next pot, and then was eliminated on the hand following this. 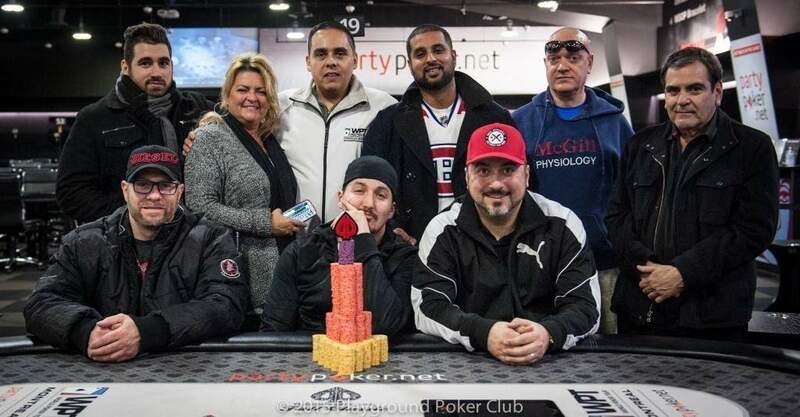 The $60 + $10 NL Hold’em Win the Button tournament was an event in the Playground Anniversary Series that was held on December 17th, 2015 at Playground Poker Club in Kahnawake. There were a total of 74 entries in the tournament, which added up to a prize pool of $4,307.00. This was distributed according to the following table. Note that there were several player deals made in this tournament which affected the prize pool distribution. First, with 8 players remaining the players chose to withdraw a total of $100 from the 2nd and 3rd place payouts to pay the 8th place player (bubble save). 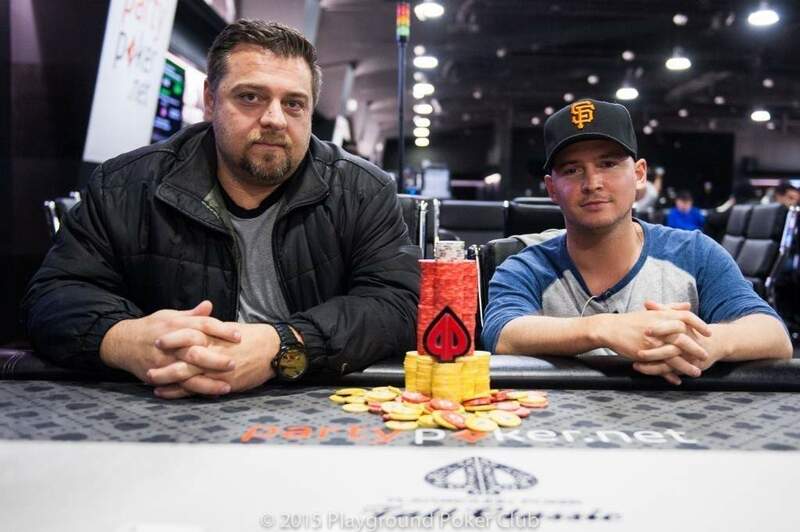 Then at 3 players remaining, the players chose to award the 3rd and 2nd place finishers $900 each, leaving $1,177 for the player who would eventually finish in first place. 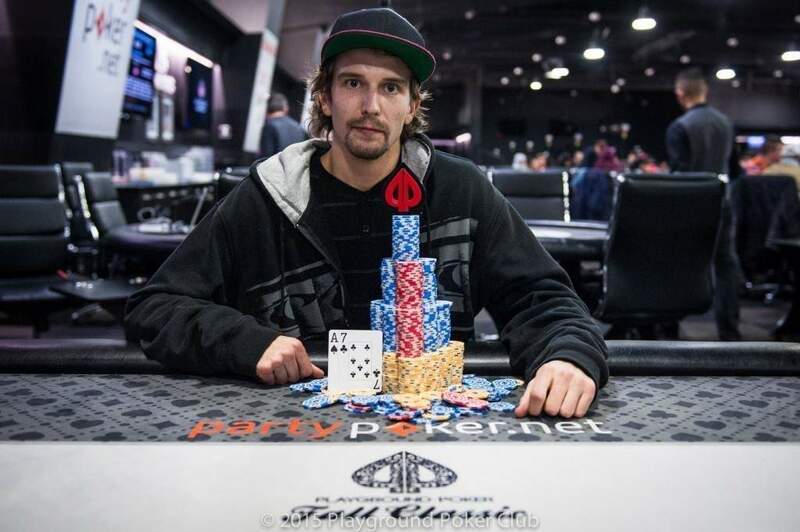 When heads-up play began, the two remaining players, Jean Philippe Pepin and Giovanni Petrella, decided to further modify the remaining prize pool, settling on $977 for 2nd and $1,100 for first. 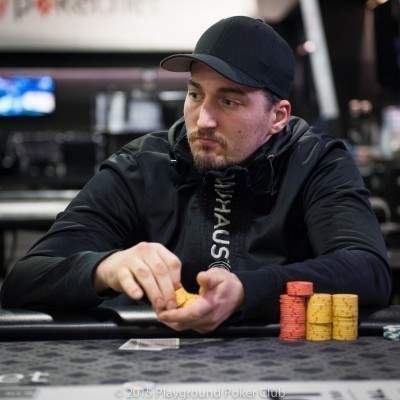 After just a few minutes of heads up play, the two players chose to divide the remaining prize money evenly between them ($1,039 each) and the tournament was over. Once Owen Snow was eliminated, the Win the Button tournament sped up to a blistering pace with 4 players remaining. 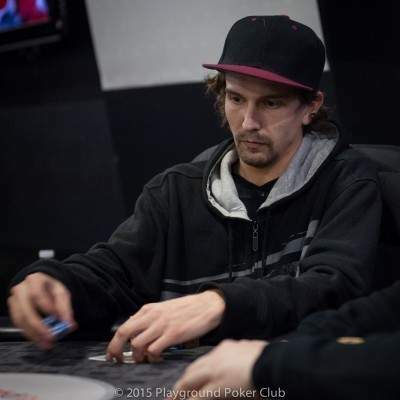 First to go out was Sebastian Pasternak, who was eliminated in 4th place. Once Sebastian was out, the remaining 3 players decided to make a deal for the remaining prize pool. The initial agreement between them was to award both 3rd and 2nd place $900 each, leaving $1,177 for the player who would eventually finish in first place. This deal was arrived at very quickly – 3rd place money on the payout chart was just $690 – and just as quickly, Alissa Ann Allen was headed to the Tournament Desk to collect her payout coupon. When heads-up play began, the two remaining players, Jean Philippe Pepin and Giovanni Petrella, decided to further modify the remaining prize pool, settling on $977 for 2nd and $1,100 for first. But after just a few minutes of heads up play, the two players chose to divide the remaining prize money evenly between them ($1,039 each) and the tournament was over. Note that in many of our festivals and series, players are obligated to play to a winner in every event, including reserving a portion of the prize pool for the player in 1st place. 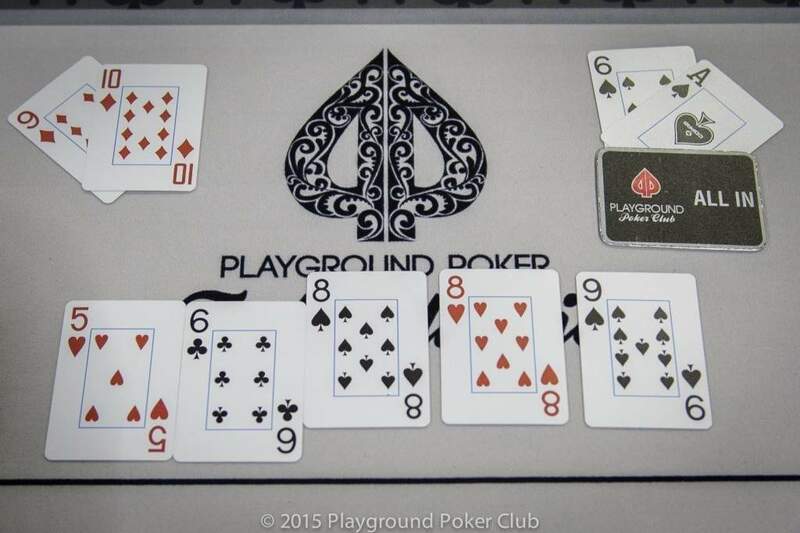 This is NOT the case in these Playground Anniversary Series tournaments – players are free to divide up the prize pool any way they please (and that everyone playing agrees to), up to and including chopping the prizes and stopping play immediately. 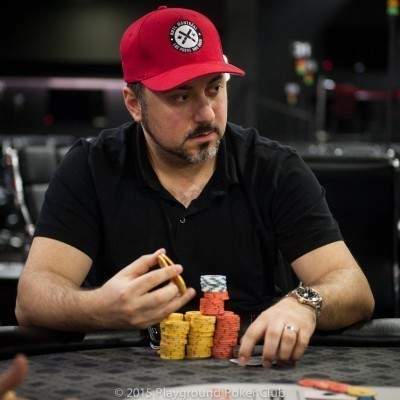 After a relatively long period of chips mostly shifting from player to player – particularly considering the stack sizes in play relative to the blinds – Owen Snow found himself down to 75K and decided to open shove – blind. 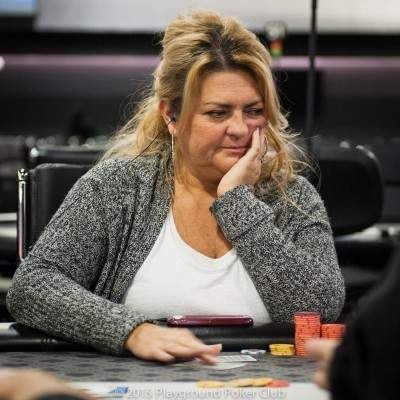 Alissa Ann Allen folded but Giovanni Petrella made the call. 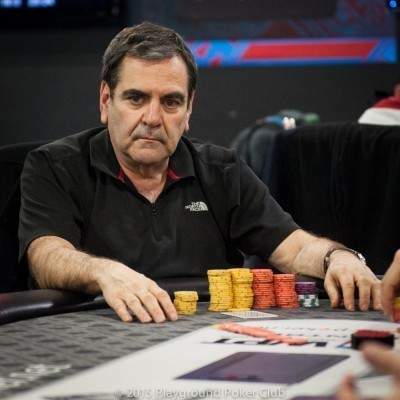 Jean Philippe Pepin strongly considered calling as well, but chose to fold. There was a pair for Giovanni on the flop of meaning Owen would need running cards to come out on top – but when the was dealt on the turn the hand was effectively over. The river was a meaningless . The 6-max ends in a chop! After playing 9-handed for almost 2 levels, the remaining players have decided to negotiate a deal to split the money based on their current chip stacks. 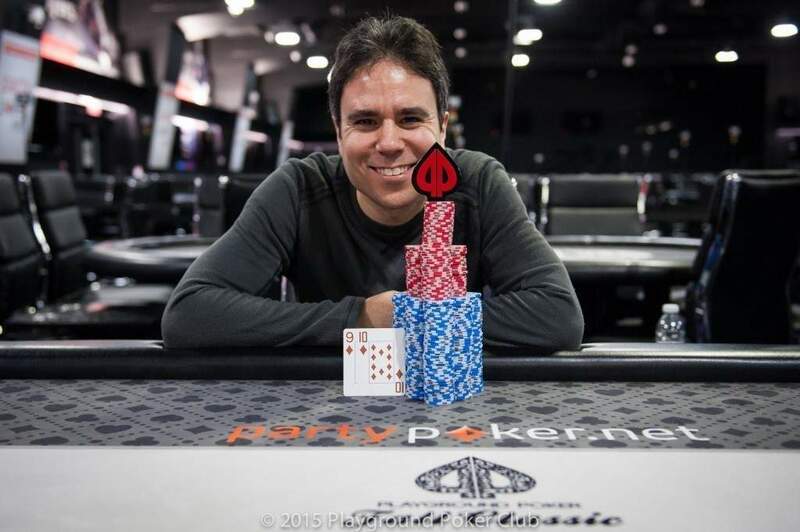 After 19 levels of play in the 6-max, it’s Jerry F who leads the way with a stack worth 551,000. The bubble has just burst here in the 6-max event, which means the 17 players that still have chips to their name have just locked in a spot in the money! The difference between the Anniversary events and larger Playground festivals is that players have much more freedom to make deals and even to make deals that bring the end of the tournament. In this instance, that is exactly what happened. 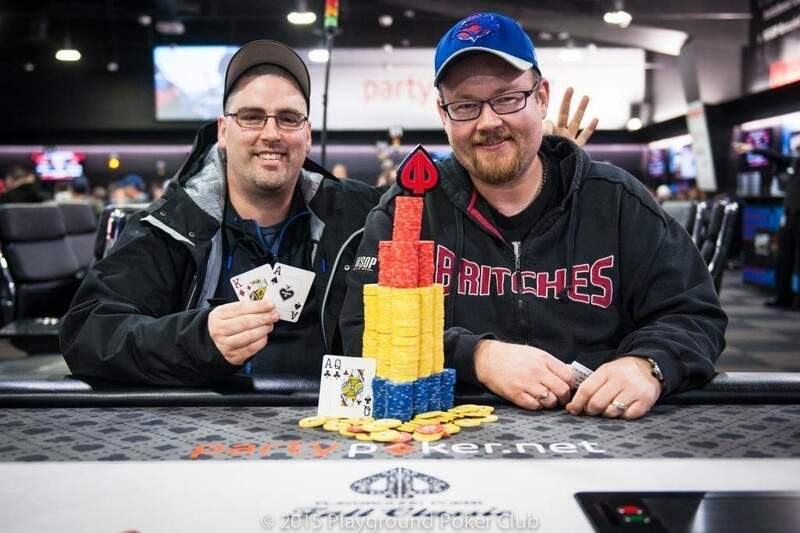 As the two remaining players, Stephen Langlois and Yun Jung Yang made it to heads up play, they instantly split the prize pool in half, each taking $996.00 for their efforts on the day. Yang chose not to be in the Champion’s photo, so we have included a photo of Stephen and an extra photo of Stephen and 3rd place finisher Glenn Sauve. 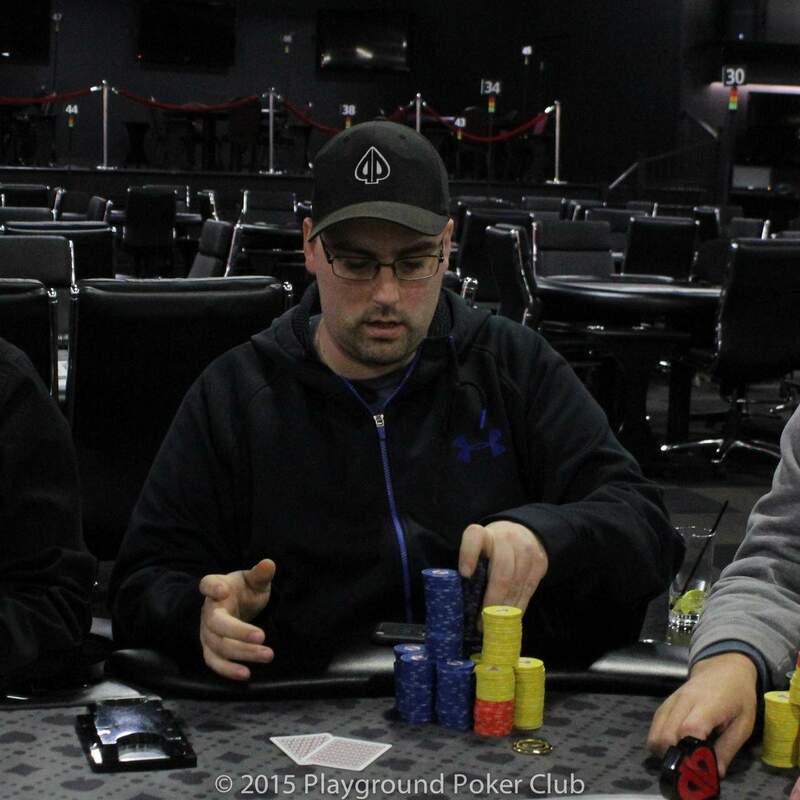 With 3 players remaining, the players decided to each secure a $720 payout and pay $553 to first place. Action was very quick after the agreement was reached, and Glenn Sauve was the player to be eliminated in 3rd place. 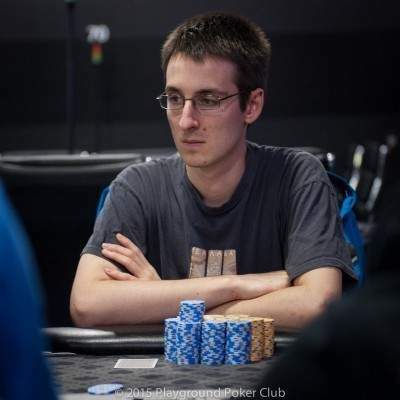 Julien Boulerice has been eliminated in 4th place in the Big Ante tournament. 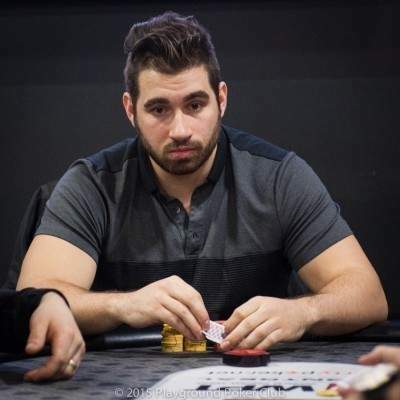 Julien was one of the two shorter stacks coming out of the last break, but although there hadn’t been an elimination in a while, chips have nevertheless been moving around the table quite a bit, and Julien had recently ranged from the short stack to 2nd in chips. The $200 + $20 Deepstack tournament was an event in the Playground Anniversary Series that was held on December 17th, 2015. There were a total of 128 entries in the tournament, which added up to a prize pool of $24,832.00. This was distributed according to the following table. Robert Aho navigated through a field of 128 players to arrive at the elusive final table as the chip leader. 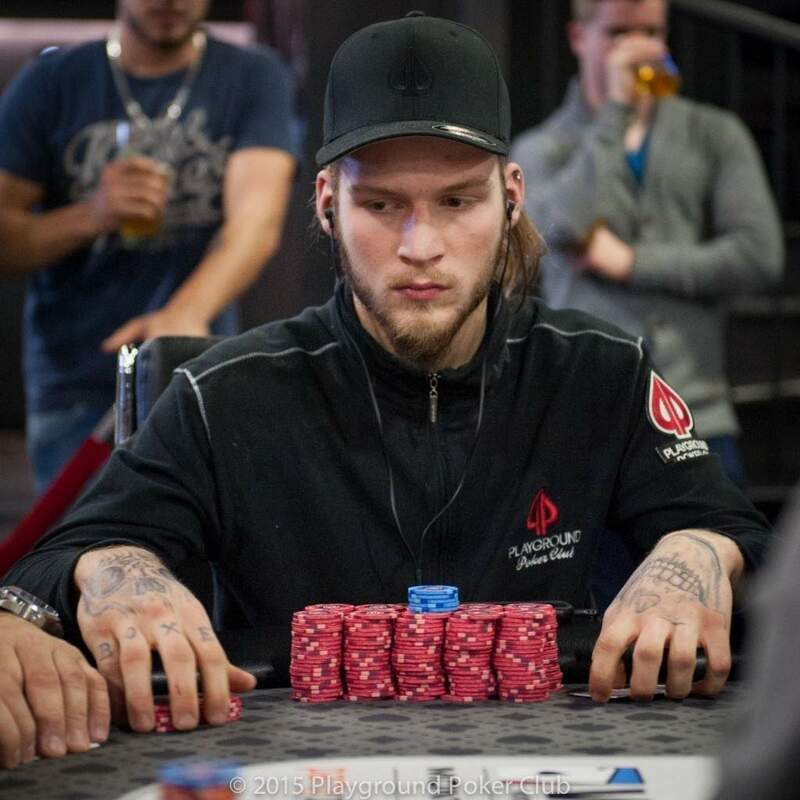 He then managed to maintain this lead throughout the duration of the final table, before finally finding himself heads-up versus Mathieu Fonderflick. After only a few hands of play, Mathieu’s 5 big blind shove was called by Robert, and it was virtually a flip. Mathieu tabled , and was up against the of Robert. He was poised to double up, until Robert spiked a pair on the river to take down the pot, and the tournament. Mathieu’s second place finish earned him a cool $4,450 in cash, while Robert’s victory was worth a sweet $5,900! 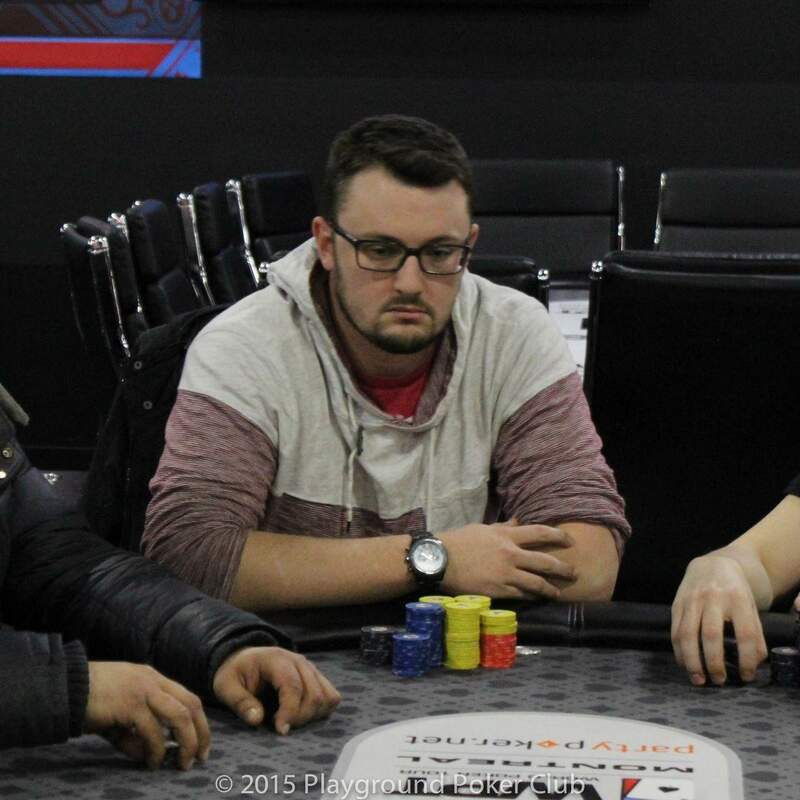 The $200 + $20 Deepstack has just reached heads-up, as Nick Frascarelli was eliminated in 3rd place. Robert opened his button to 125,000, and found a call from Nick on the button. With the board showing , Nick open-shoved for 495,000. Robert tanked for a few moments before finally making the call, and players tabled their hands. Robert’s pair of queens held on for the win, as the running cards ( and ) changed nothing. Heads-up play is now underway, with Robert holding a lead of roughly 5-to-1.